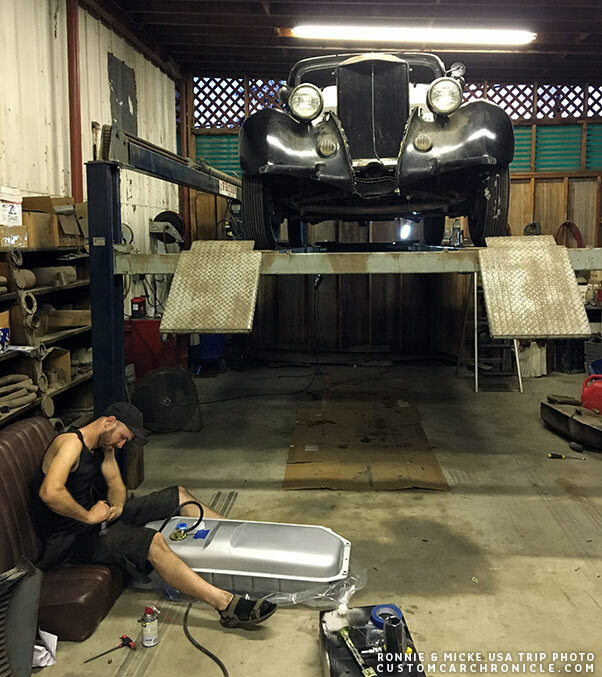 How to get two historic stalled Custom Cars back on the road and make a once in a life-time Road Trip. 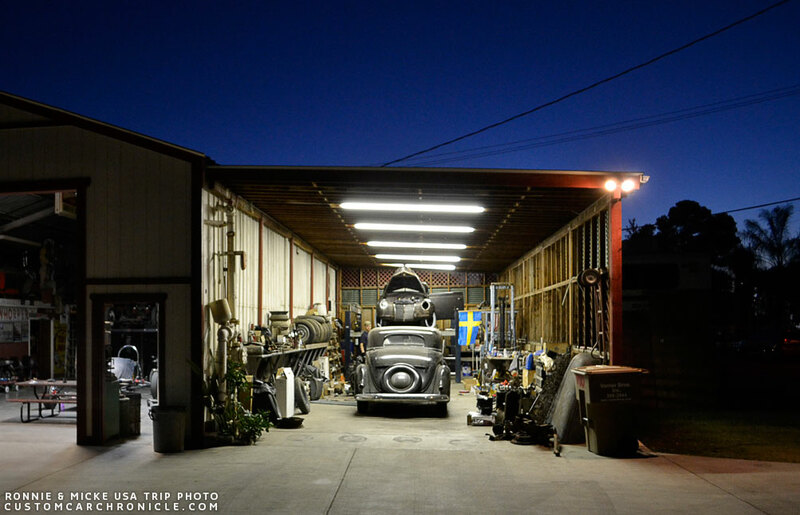 In early July 2016 Ronnie Lindblom and Micke Hedberg left Sweden for their dream road-trip in the USA. 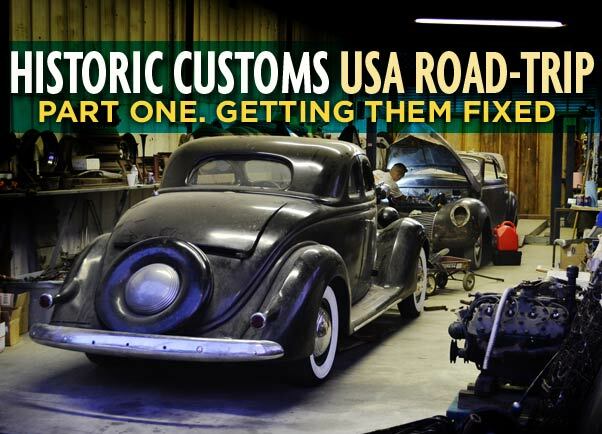 Both guys had bought an historic custom in the year prior to this trip, and along the way the idea had grown to fix up their cars in the US, and make a road-trip of a life-time before shipping their cars to Sweden. 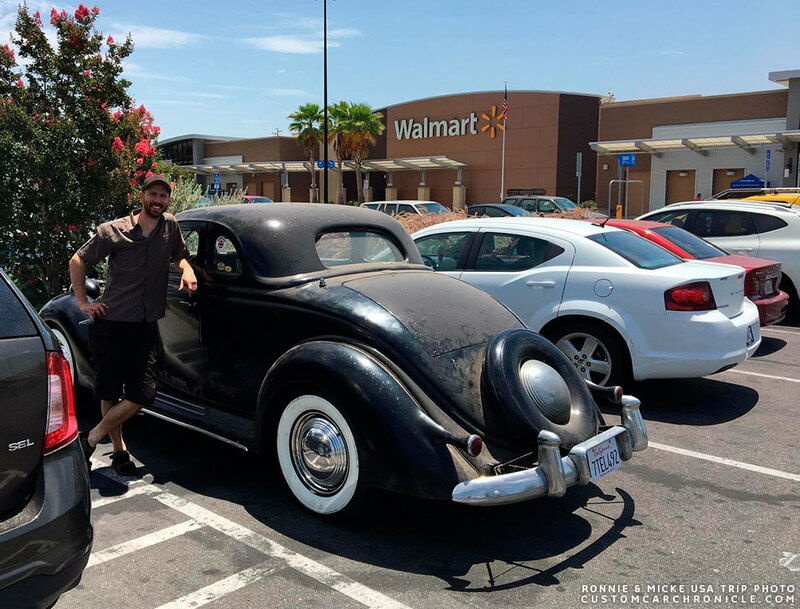 Ronnie had bought his early 1940´s restyled 1939 Mercury chopped padded topped convertible in the summer 2015 from Kevan Sledge, and Micke bought his 1936 Ford 5-window coupe in November 2015. 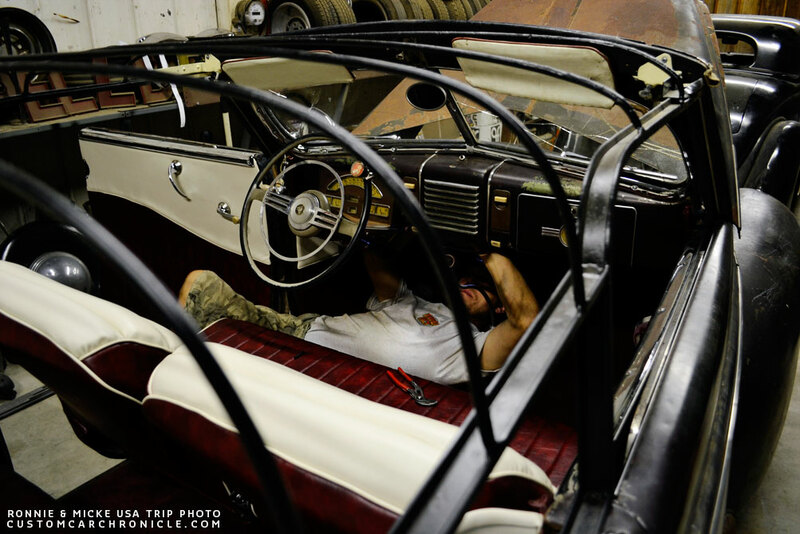 The Mercury had been for sale previous at the LA Roadster Show (LARS). At this show an older gentle man had pointed out that he was very familiar with the car. But at the time the man was not properly interviewed and no contact info was written down. This all lead for Ronnie and Micke to make the 2016 LARS their prime goal… who knows, perhaps the older gentleman would make an appearance this year again. 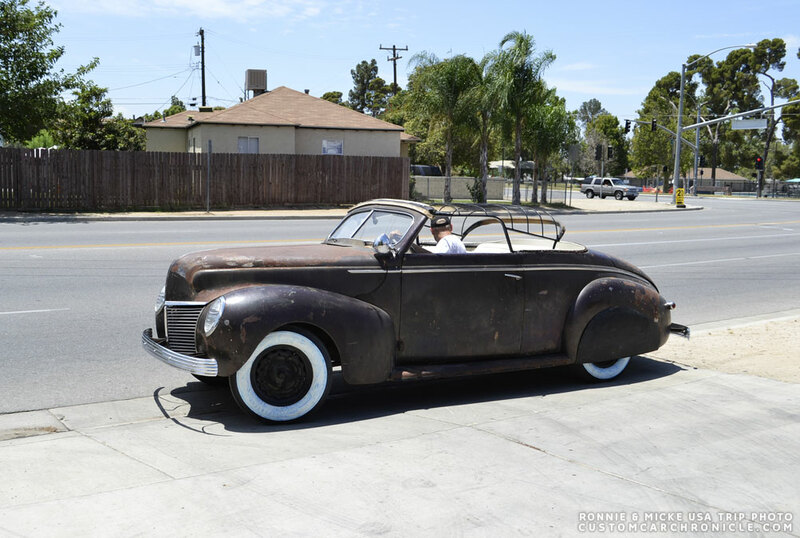 Micke’s 36 Ford has a Long Beach history, so he was also hoping to find out more about who had originally performed all the well done body work on his Coupe. 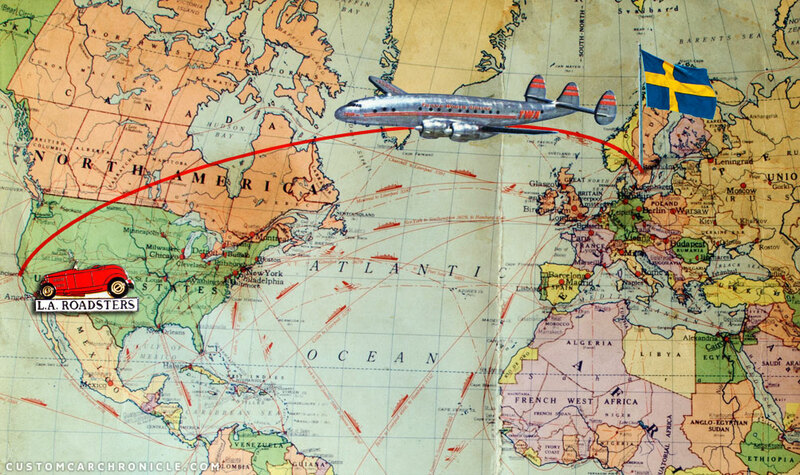 Plane trip from Sweden the US on June 2, 2016. Blue trip with Squeek’s pick up and Ronnie’s ’39 Merc on the trailer to Bakersfield (blue pin). After 160 hours in 11 days and half a day to clean up the mess the first trip to Gene Winfield in the Mohave desert. 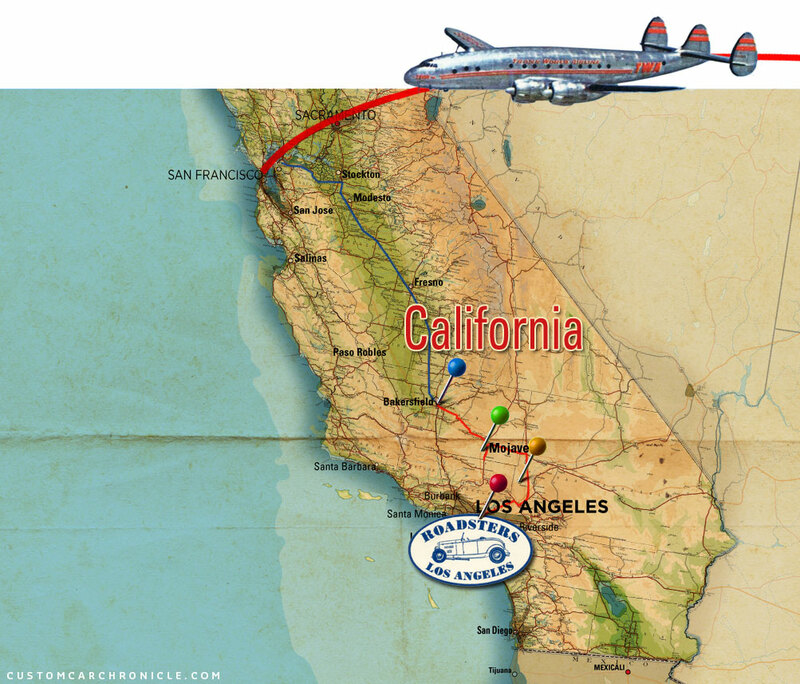 (Green pin) Next stop is El Mirage (Orange pin), and then to the LA Roadster Show (Red pin). 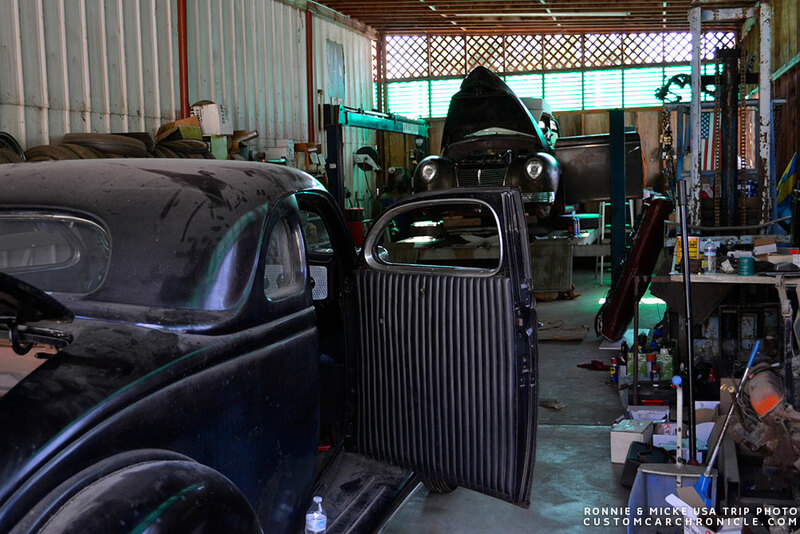 Both Ronnie and Micke had started collecting parts from the moment they bought their cars. Some were delivered in the US, others had to be brought from Sweden. Three suitcases full of car parts, hand-luggage with a few clthes and two hats… All they need. 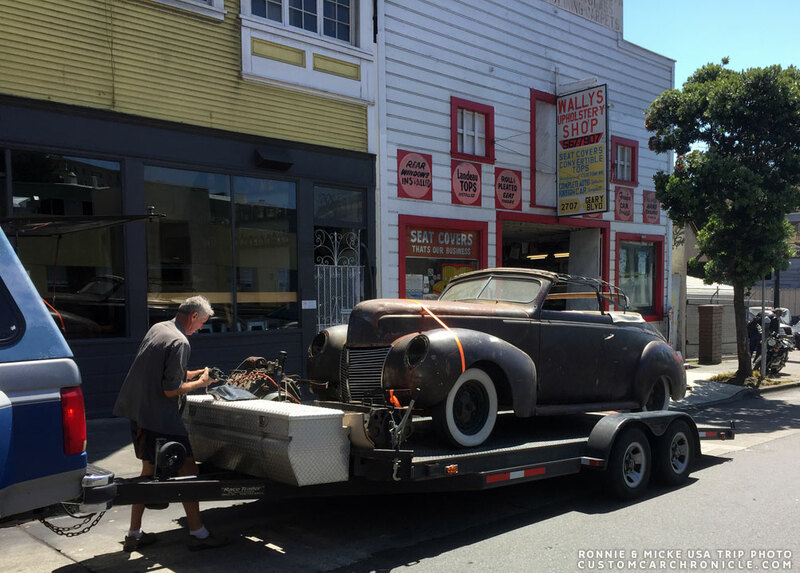 Ronnie and Micke took a taxi from the SF airport to the upholstery shop in San Francisco that had done the interior for Ronnie’s Mercury and stored the car until now. They met Squeek at the shop, who was there with a trailer to pick up the guys and the Merc. On the way up Squeek he also had picked up some parts for the Merc and a spare engine for Micke’s ’36 Ford at Kevan Sledge’s place. 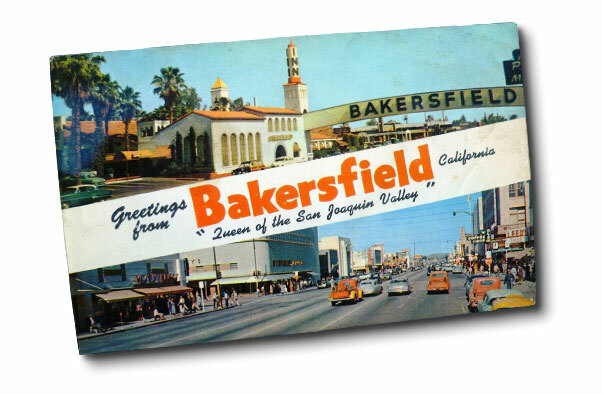 Once the Merc was loaded on the trailer it was off to Bakersfield where the real work could start. They arrived at Squeek’s home/shop late that night. 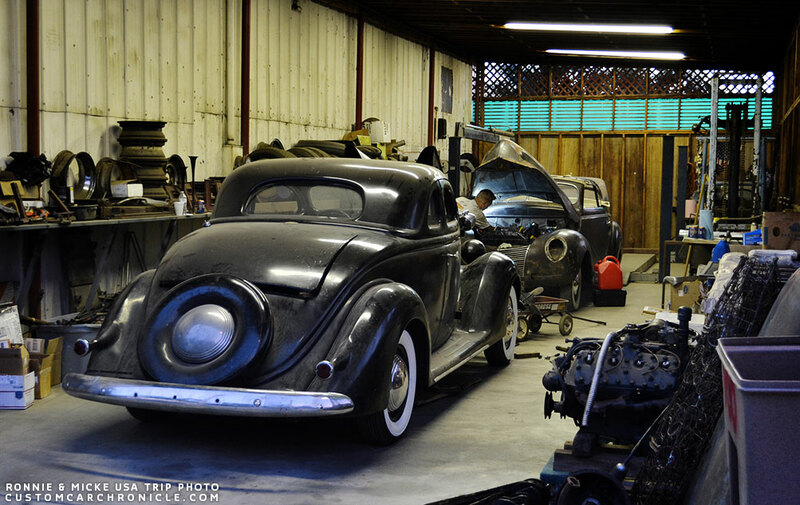 Ronnie’s Merc was unloaded and Micke saw his ’36 Ford for the first time in person. Micke had it shipped from the guy he bought it from in Oregon to Squeek’s shop in Bakersfield the week before. 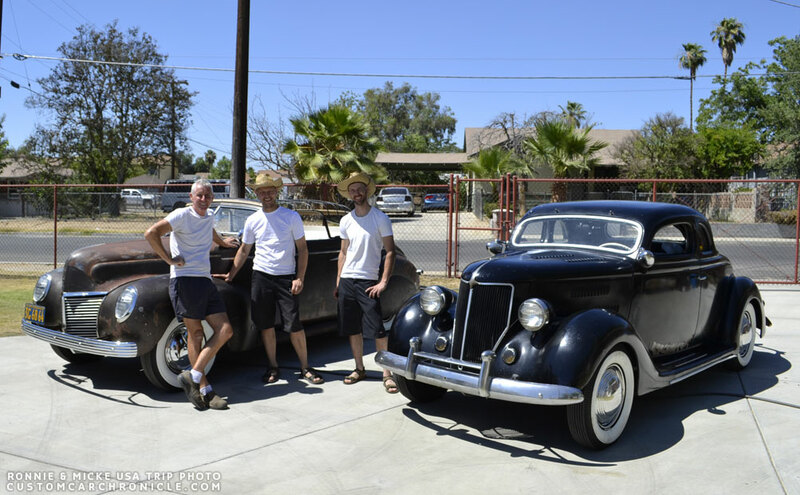 Ronnie and Micke worked at least 160 hours in 11 days to get their cars fixed for their planned road trip to Gene Winfield, El Mirage, the LA Roadster Show and the end destination, So Cal Classics that would ship their cars by container and boat to Sweden. The guys slept in the office, just to save time. First thing on the agenda was to make a list of things needed and visit the local car supply store and super market to get parts and human fuel. The first big hurdle was to get the cars registrated and legal to drive on the road. 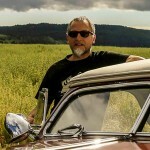 Micke had already arranged full insurance on both cars from Sweden, and made an appointment at the local DMW office for registration on the Merc. Registration and inspection of the coupe took a bit more time as the title was too old. After some long hours and some administration problems they left the DMV with new registration plates and tax tags! With all the paperwork out of the way, the real work on the cars could start. Squeek had made sure the guys had plenty of space to work at, their own personal garage, and let them borrow special tools when needed. Ronnie and Micke brought some tools from Sweden and bought some at the local toolstore. They figured a big box of tools would be needed to ensure the trip to LA. 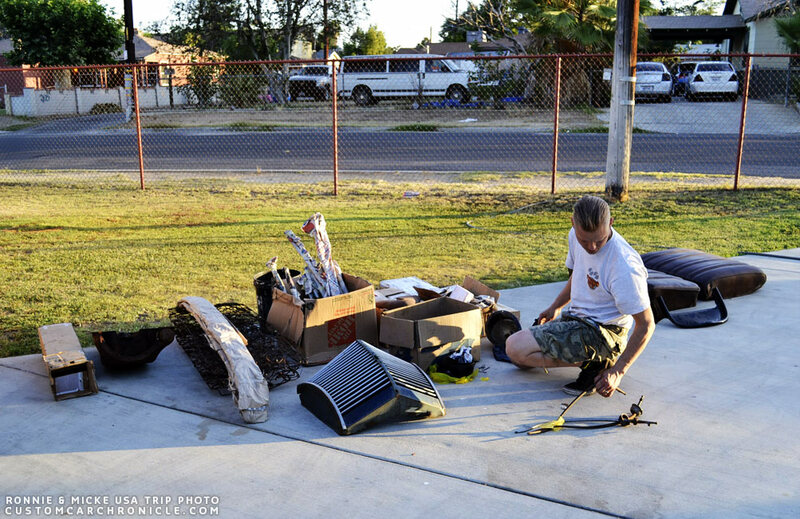 Ronnie inventorying all the parts he had brought, shipped and found in the car. 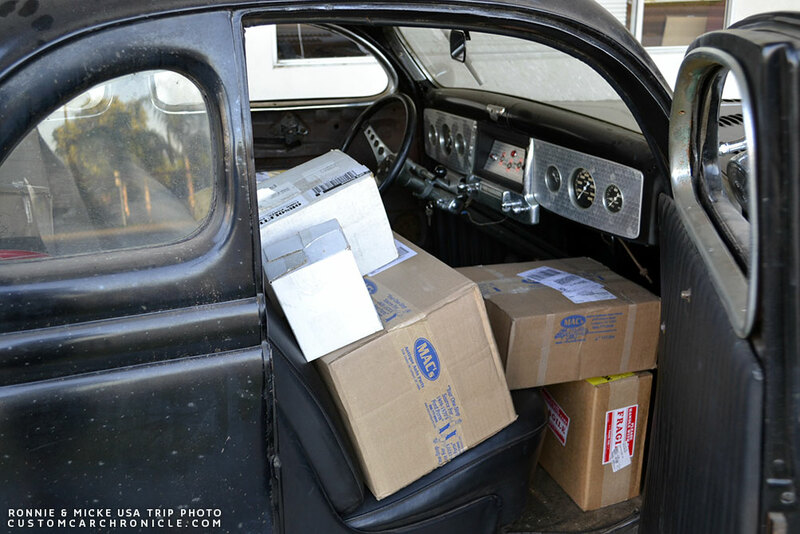 Micke’s 36 Ford was also packed with all kinds of parts and stuff needed to get his car back on the road. The parts were ordered over time and all delivered to his friend John Terry in Oregon, where the car was stored before being shipped to California. And then… the hours and hours of work on the car begins. Long days, late into the nights, early starts, no distractions, and just one goal. Brake repairs with everything new from mastercylinder to brakeshoes and overhaul inspection of bearings to make sure the car would be able to make the road trip safe, and stop where needed. The car has not been on the road since the late 1970’s. 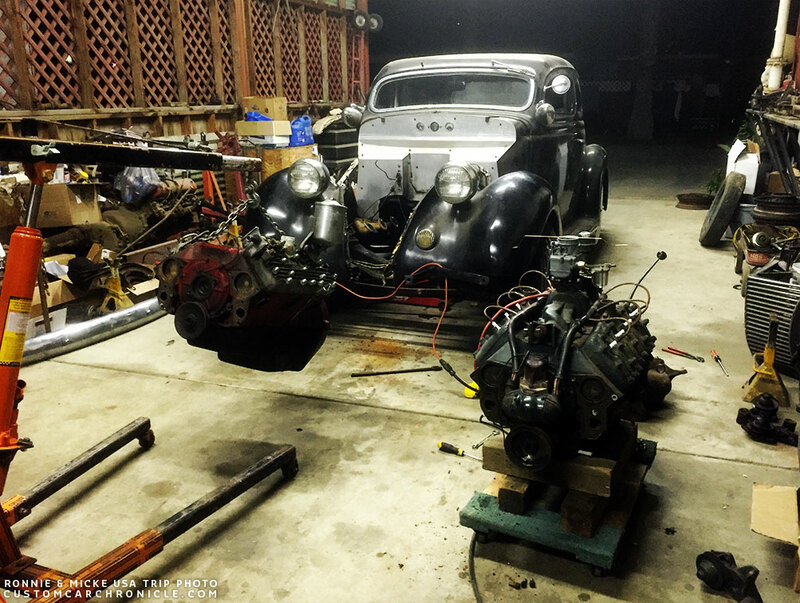 Micke did all he could to make the original engine that was in his ’36 Ford to run. He had made a special tool back in Sweden, to use at the starter gear. 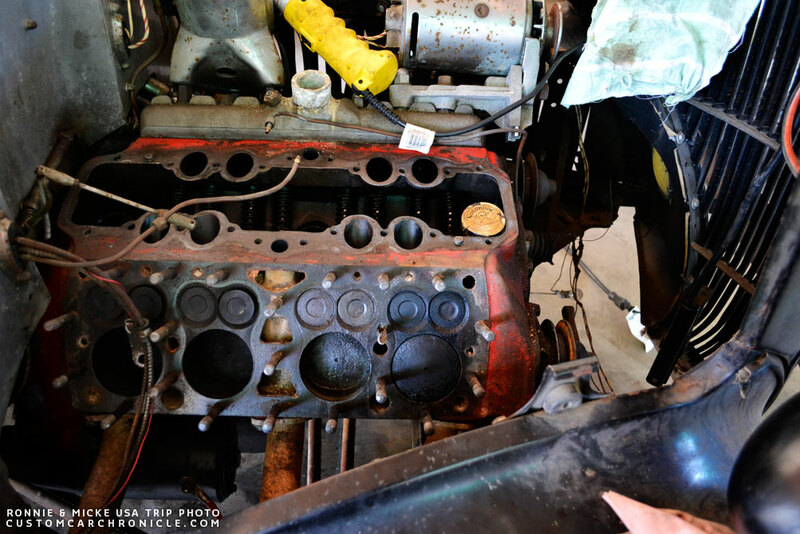 The heads and intake were pulled off and he made sure the valves were loose. While Micke was under the car with a long socketwrench and the special too, Mike Parker, a friend of Squeak tapped the stock piston. The engine got loose and turned over… but not enough for the starter on his own power. Even after a couple of days with lubricate and wrengching. Micke ran out of time to spend on the engine, so he had to replace it with the spare engine to make sure the car would run. 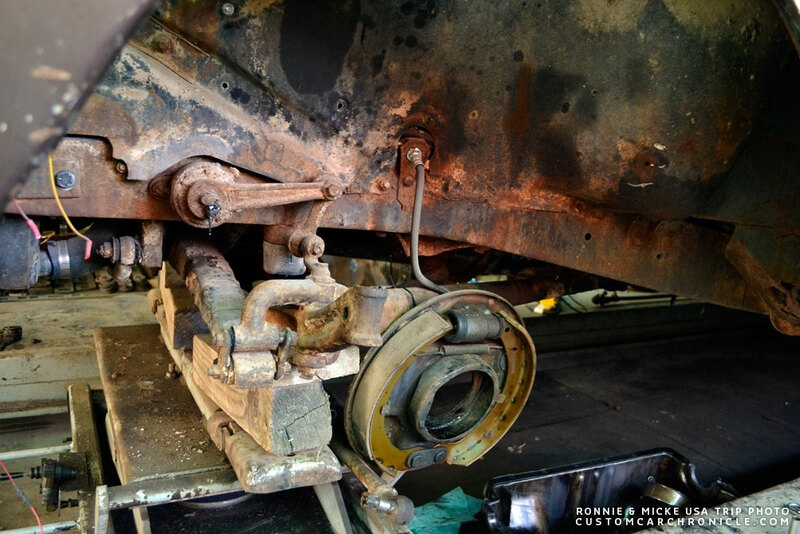 Everything on the brake system had to be changed to make it road-safe. The first time Ronnie lifted the Mercury, he got unexpected news. The spindle bolt was so dead that the wheel move at least an inch. So new bushings had to be installed. And the next surprise was that the steering rods was hitting the oilpan. Sweet! Ok let´s dig up a truck pan to a 8ba. Luckely Mike Parker had a spare one that could be used on the Merc. Working until late in the evening was needed to make the deadline. 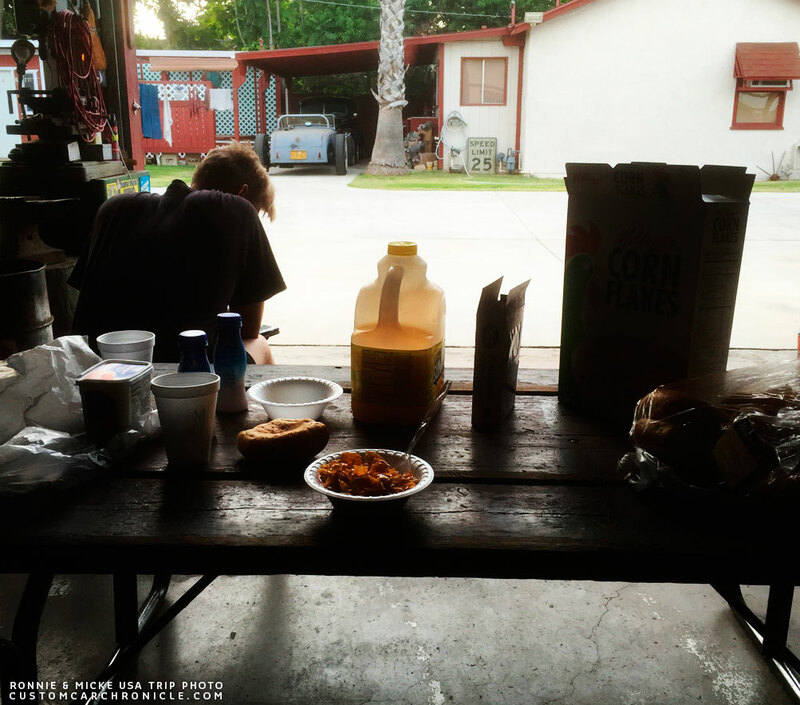 Up early, and a quick breakfast in the shop. The locals laughed and asked if they always lived on serials and frozen pizza’s… and beer?! Micke droped the pan down to check it, clean it and replace the old oilpump before the new engine was going in. 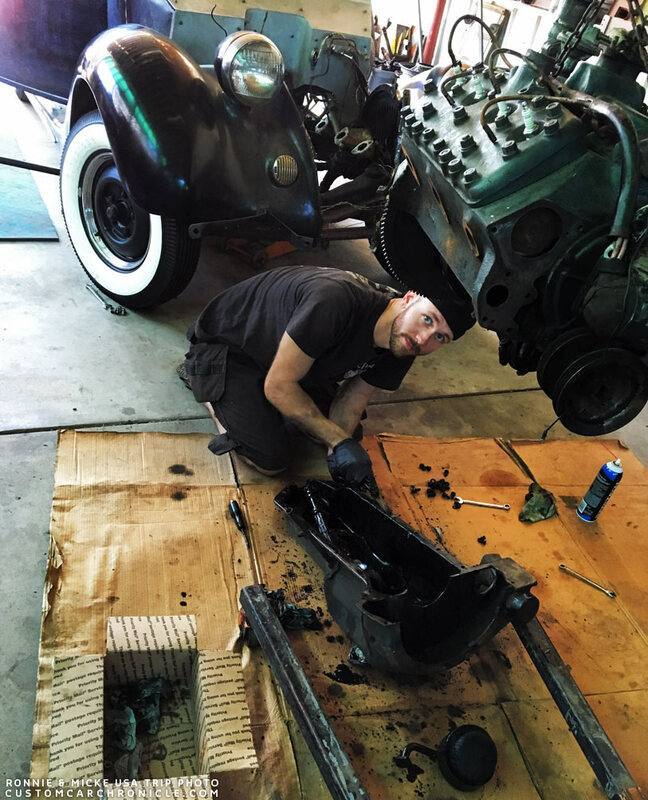 Micke is prepping a new gastank for his ’36 Ford. The cooling system on the 36 was totally clogged, Micke had the radiator flushed and boiled at the local radiator shop and installed all new hoses. 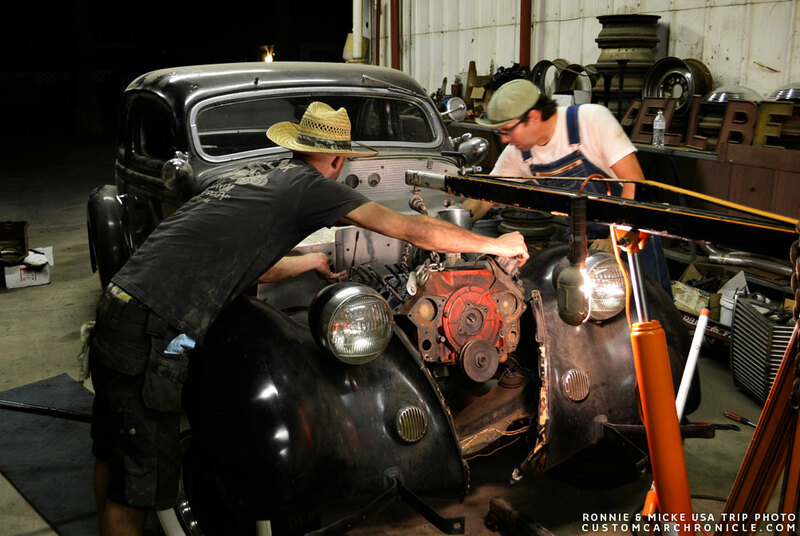 Micke’s Ford is now almost drivable… Ronnie is still working hard to get his ’39 Merc ready. Yeah… 50% of the mission completed. 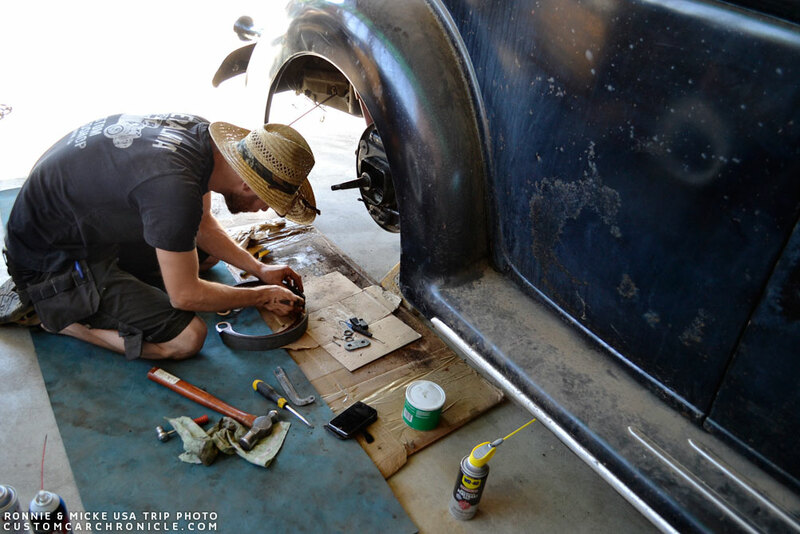 Micke’s ’36 Ford coupe is back on the road for the first time since the late 1970’s. The crew has a new parts getter. 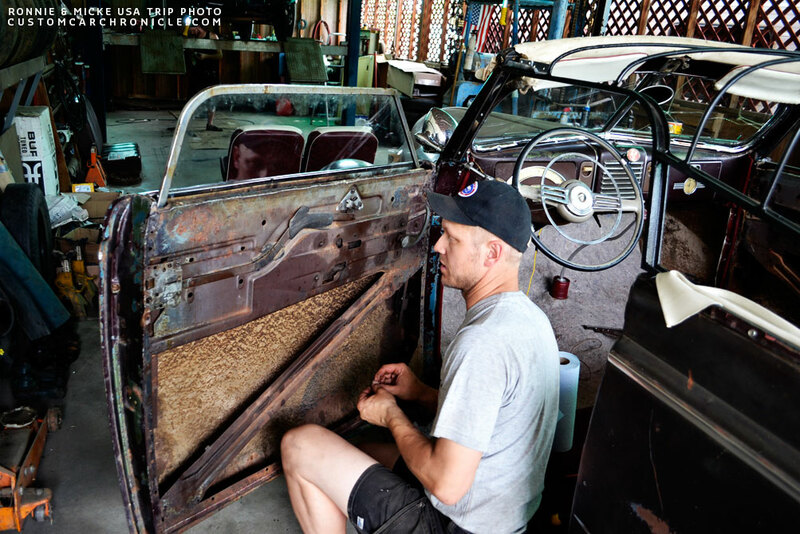 Ronnie’s Merc is back on the floor, and now its time to install new glass.. Interior back in, and getting all the electric stuff to work. 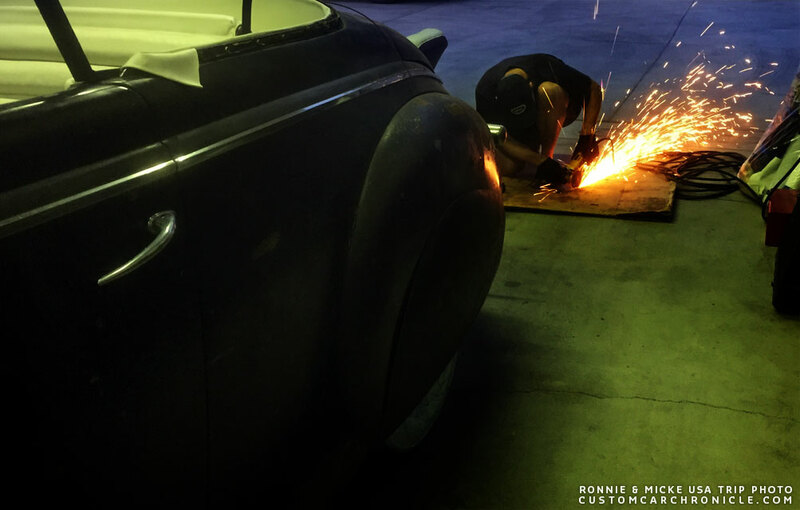 First time on the road for Ronnie’s ’39 Mercury since 1959. 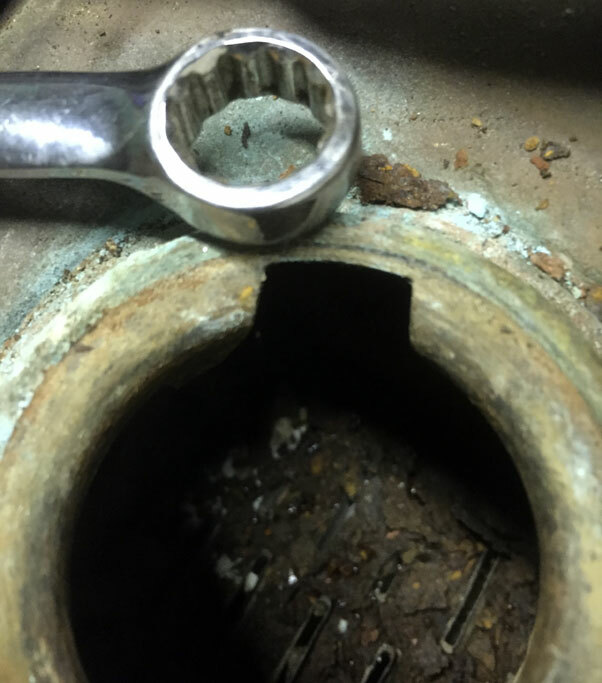 For a short time the guys thought they would be done early the last night in the shop, but after a frozen pizza and a couple of beers the crew noted some stinky smell coming from the ’36… O´boy! It turned out to be the coil was melted over the crank pulley… They didn’t have any working spare coil and as the timing-cover was the wrong type for the spare dist. Micke decided he had to replace the timing cover. As they didn’t have a fitting socket for the crank pulley nut Micke had to cut the pulley off with the angle grinder to make space for a big monkey wrench to fit. With the new dist mounted Micke made the final test-drive three thirty in the morning. Now the coupe was running like a kitten again! Pjuhh…bedtime! 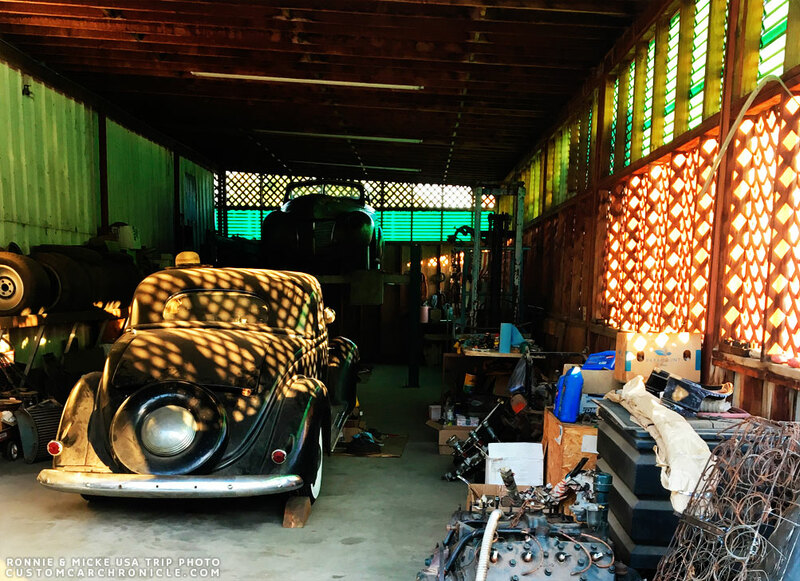 They made it… both cars are done, and ready for the trip to the LA Roadster Show, with a stop at Gene Winfield and El Mirage along the way. Micke and Ronnie want to say a BIG thanks to Squeak for all help for everything!! Transports, lodging, workshop, work and great company!! We never would have made it in such a short time at another place for sure! Thanks for a really great time! They also want to thank Mike Parker for all the help and running errands around town. Cools story! Thanks for sharing Rik. Can’t wait for the second half. These guys definitely have some enthusiasm! Squeak deserves all the credit he can get! What a great help! I had the pleasure if meeting him a couple of times him a couple of years back. Such a nice guy, and a great experience every time! Wow! And in 11 days!! The feats of Hercules pale in comparison. What dedicated effort, and Friends. Thanks for sharing. Great enthusiasm, great efforts, great helpers, great friends, great story.. and, GREAT CARS!! Nice! Coolest story , about some dedicated kats for sure . Can’t wait to hear about the rest of their journey . wauw…what an adventure..you guys are amazing…cant wait to read the next chapter.